3 April 2018 — Ever wondered what the office of one of the top companies in Asia looks like? Our Young Trailblazers were given the opportunity to do just that by visiting Prudential’s Workplayce, a pioneer in integrating work and play at the office. Nestled in the glass facades of the Business and Financial District in Marina Bay, Workplayce’s nature-inspired water and greenery features as well as flexible open spaces encourage a more self-driven and organic work ethic that the Young Trailblazers immediately identified with, given the competition’s online and versatile curriculum. 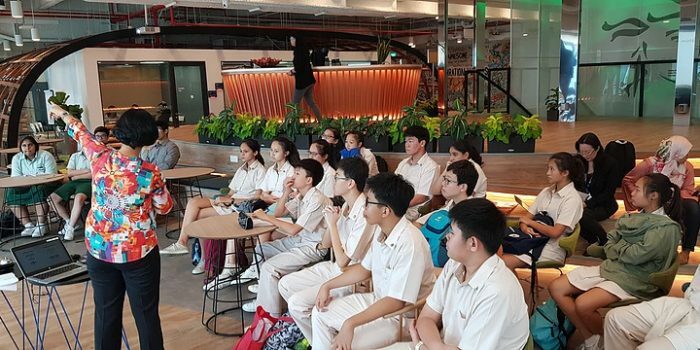 Upon arrival, our Young Trailblazers were first greeted by a million-dollar view of the Marina Bay skyline in the office’s convertible and multi-functional theatre. They were first greeted by the Director, Head Customer & Digital at Prudential, Ms Namrata Jolly, who emphasised the importance of customer obsession. During her address, she explained what it meant to have the customer at the centre of the whole operation model, rather than the dated model of merely providing services without really evaluating customer’s needs. This aligns with the first task of the competition, where our Young Trailblazers had to first empathise with the client’s problems, so that the solutions innovated would address a real, not perceived, need. In previous iterations, the keynote address was given by Prudential’s Head of Design Innovation, Mr Matt Collier, who shared his growing aspirations which ranged from wanting to be a pilot to becoming part of Obama’s administration. He asserted Design Thinking as the new basic literacy, replacing current basic literacies due to its increasing relevance in a disrupted world. He elaborated on his own application of design thinking in different fields, including politics and aerospace, and also encouraged students “to be able to talk and wrestle over each idea until emergence (of new discoveries or connection) happens.” This foregrounds Schmeet and Acorn Training’s desire to move Beyond Academics and pursue something greater and more impactful than just academic success. Our Young Trailblazers then revised their Design Thinking capabilities by re-designing the gift-giving experience with materials from the crash course curriculum adapted from Stanford Design School, thus revising and fine-tuning their Design Thinking competencies. They then had a chance to go on a guided tour of the office, whose groundbreaking design promotes a culture of innovation in the company by including productivity enclaves, sleep pods and using technology to facilitate the sharing of such facilities. 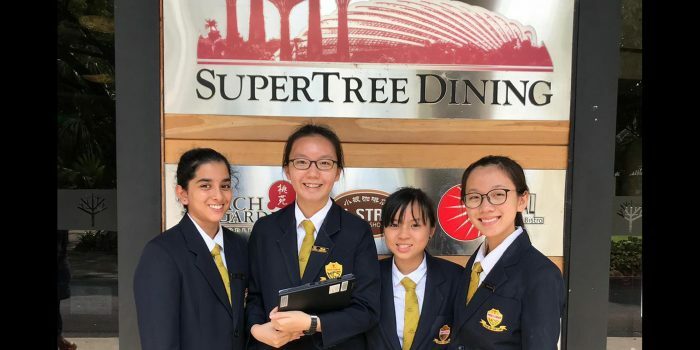 When asked about her experience in the competition so far, Nazimah from Commonwealth Secondary School mentioned, “It’s difficult to balance school and CCA commitments with the competition tasks but I’ve really learnt a lot about how to address the community’s needs. My teammates and I even went down to MINDS for the empathy phase of the curriculum and it was a really eye-opening experience.” Commenting on the online syllabus, she said, “I find the commercialisation component useful because it teaches me how to make sure that I make money! I plan to use the business plan to sell my self-designed shirts during my school’s upcoming carnival in June.” It is indeed heartening to know that the competition is sowing the seeds of future groundbreakers in our very own Young Trailblazers. 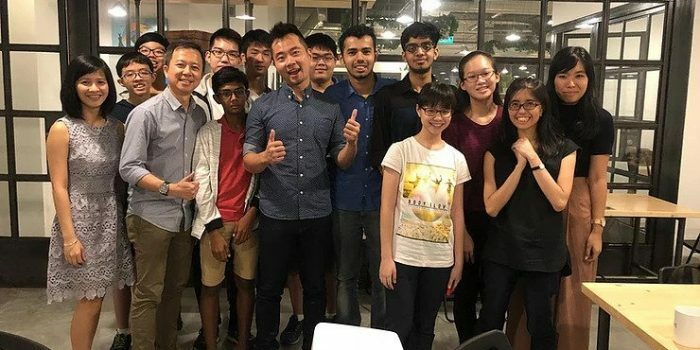 The Learning Journey was indeed an eye-opening and priceless opportunity to experience firsthand how Innovation and Entrepreneurship works hand in hand to reinvent the wheel. We look forward to seeing everyone’s final submissions and wish all Trailblazers the best of luck in the competition! We would also like to thank the following schools who claimed the limited slots of the Learning Journeys for their active participation and continued efforts to craft innovative and meaningful solutions for their customer’s needs. Keep on Trailblazing! previous post: 2018 Results are Out!